New to Gardening? Sign up for our Gardening 101 Class and get expert advise on how to grow successfully in San Diego. New to seed starting? We can help! Chose from our wide seed selection today! Items in GREEN can be planted year round! Not sure about a gardening term? Check out our gardening glossary for help! Amendments – Soil-conditioning substances that promote plant growth indirectly by improving soil qualities such as porosity, moisture , retention and pH balance. Annual – Living only one growing season. Axillary Bud – a bud that occurs in the leaf axis or upper angle where the leaf joins the stem. Tomato suckers arise form the Axillary bud. Biennial – A plant that needs two growing season to produce a flower. Most after the giving flower, set seed and die. Bolting – a plant going to seed prematurely, common with many winter vegetables when planted during summer season and temperature rises to an intolerable degree. Cloche – a bell-shaped glass cover placed over a plant to protect it from frost and to improve its growth. Companion planting – the planting of different crops in proximity (in gardening and agriculture), on the theory that they assist each other in nutrient uptake, pest control, pollination, and other factors necessary to increasing crop productivity. Companion planting is a form of polyculture. Companion planting is use d by farmers and gardeners in both industrialized and developing countries for many reasons. Container Gardens – Growing a garden of outdoor plants in containers , typically on a rooftop or a small city plot. Closed system farming – farming with techniques that promote and sustain self reliance with little to no outside inputs. Crop Failure – the failure of crops to produce a marketable surplus. Crop rotation – the practice of growing a series of dissimilar types of crops in the same area in sequential seasons. Cultivar – a abbreviation for “cultivated variety” usually a named variety. Cut and come again – this technique uses the act of cutting the outer leaves or topping o the leaves of greens about an inch above the soil without pulling up the entire plant by its roots so the plant may continue to produce leaves. Determinate – Having the primary and each secondary axis ending in a flower or bud thus preventing further elongation. A determinate vegetable has the characteristic of the fruit ripening at the same time allowing for a singular large harvest. This is preferred by commercial growers. Direct sow – planting directly in the ground soil, no transplanting necessary. Not recommended for vegetables with smaller seeds or non-root crops. Fertigation – to fertilize and irrigate at the same time, by adding fertilizers to the water supply. Foliar fertilizing– A method of feeding a plant by straying product directly onto foliage. Harden off – Allowing seedlings that have been growing under protective/indoor conditions to acclimate to outdoor conditions in preparation for transplant to an outdoor garden. Heirloom – cultivar of a vegetable or fruit that is open-pollinated and is not grown widely for commercial purposes. An heirloom often exhibits a distinctive characteristic such as superior flavor or unusual coloration. Hybrid – the offspring of two animals or plants of different breeds, varieties, species, or genera, especially as produced through human manipulation for specific genetic characteristics. Indeterminate – Having the axis or axes not ending in a flower or bud, thus allowing further elongation. Indeterminate vegetables have the characteristic of the fruit ripening individually, providing a long harvesting season. This is preferred by home gardeners. Monoculture – the agricultural practice of producing or growing a single crop or plant species over a wide area and for a large number of consecutive years. It is widely used in modern industrial agriculture and its implementation has allowed for large harvests from minimal labor. However, this ratio remains true only if the accounting for labor required is limited to the number of workers employed on the farm. If the indirect work of employees involved in producing chemicals and machinery are taken into account, the ratio of labor to output is higher. Mulch – a covering of straw or compost spread on the ground around plants to prevent excessive evaporation or erosion, to enrich the soil and/or to prevent excessive weed growth. Nematode– a microscopic parasitic worm that lives in the soil and causes varying degrees of damage. Node – place where plant leaves and axillary buds sprout and grow. Open pollinated – Pollinated by the wind, insects, birds or animals, not by human manipulation. Open-pollinated plants or seeds are also referred to as non-hybrid. An open pollinated plant will grow true to type each year. It produces offspring exactly like the parents. An open-pollinated plant can also be pollinated by itself if it has perfect flowers. Perennial – Having a life cycle lasting more than two years. Pinch – to remove or shorten buds or shoots in order to promote a certain shape of the plant, improve the quality of the bloom or fruit or increase the development of buds and the strength of the plant. Polyculture – system of agriculture using multiple crops in the same space, in imitation of the diversity of natural ecosystems, and avoiding large stands of single crops, or monoculture. It includes crop rotation, multi-cropping, intercropping, companion planting, beneficial weeds, and alley cropping. Self pollinated – the transfer of pollen from an anther to a stigma of the same flower. Scoville scale – The gastronomic measurement of hotness or pungency of chili peppers. Stake – a stick or post pointed at one end for driving into the ground as a boundary mark, part of a fence, support for a plant, etc. Transplanting – the process of taking a single seedling from its original place of germination and placing it into a large container or directly into soil. Grow many things year round. San Diego’s amazing climates give us the ability to grow many things year round. Here is a quick guide to what can be grown year round. We collectively call this group of plants that can be grown year round “San Diego Shade Crops.” This means by growing these plants under shade cloth or in a cooler area during the warmer months can be grown year round. For more information on how to accommodate your San Diego Shade Crops in the warmer months visit “Growing Year Round”. Every California gardener can be successful with the right information. 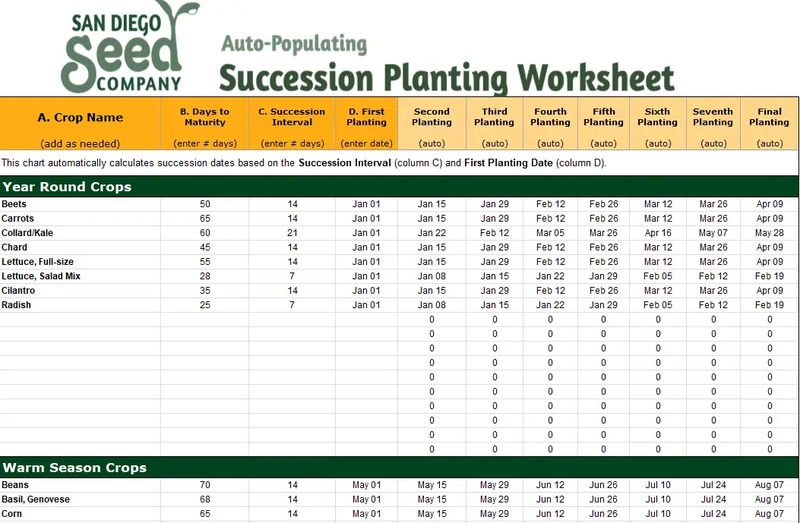 Here you can find planting dates, microclimate information and general gardening tips. Please visit our Grower’s blog for first hand information from local growers. ** Disclaimer: Planting dates are approximate. Inland areas of Southern California need semi-shaded or cooler areas to grow some cool season crops. What is the difference between cool season and warm season crops? California cool season plants prefer a temperature range of 35-75 degrees F. These cool season plants consist of more leafy plants with large portions of their composition being water. Exposure of too warm of temperatures can cause premature seed production, a process known as bolting, bitter flavor, inhibited growth, and sun scold. Lucky for California gardeners, many cool season plants can be planted year round. We term this group of plants known as “San Diego Shade crops”. Warm Season plants tend to be much larger and enjoy temperatures of 65-90 degrees. These plants must have 6 or more hours of sunlight to be healthy. This is why they grow in the longer summer months. Seed starting can seem difficult to new gardeners, but here at San Diego Seed Company we want every gardener to be an expert seed starter! Here are our top four tips for starting your own seeds. Look out for more in-depth information about seed starting information on our website. Provide adequate light for your seeds. Seeds for warm season plants should receive 6-8 hours of light. Cool season seeds need only 4-6 hours. If your seedlings are long and leggy, this is a sign that they are not getting enough sunlight. For some, seed germination may come naturally. For others, it may seem more like a science. Keeping a consistent temperature for seed germination is crucial for quality results and in many ways must be handled scientifically. We suggest placing a thermometer near your germination area to ensure the correct temperature and use shade cloth for cool season/shade crops or a heating mat for your warm season seeds. Soil must be keep moist but not soggy. If it is too wet, overwatering can lead to mold and bacteria growth which will surely kill your seedlings. Providing healthy soil for seed starting is very important because it gives the seeds the best chance to grow quick and strong. If the seeds are grown in the wrong soil type they will run the risk of being stunted and unhealthy. Refer to the back of your seed package, or to our website by clicking the seed pic at the top of this article for specific instructions and soil amendment recommendations. Ready to purchase naturally grown, local, heirloom, untreated, non-GMO seeds?